Teeth implants are the latest stage in the evolution of tooth replacement. In fact, they’ve been an increasingly popular choice over removable dentures in recent years. The future of teeth implants is quite exciting. New materials and processes make the replacement of lost and broken teeth more attractive, convenient, and affordable. As a result, dentures and bridges may soon disappear altogether. What is the Market for Dental Implants Now and in the Future? With over 100 million U.S. residents missing at least one tooth, the market for dental implants is massive. In fact, by the year 2060, the number of senior citizens over the age of 65 is expected to jump from 15% of the population to 24%. Just about 70% of humans at the age of 35-44 need no less than one tooth replaced. More than a fourth of the populace aged 74 and older have no teeth left. That means a large potential market. The interest in dental implants will likely skyrocket in the years to come. Will Dental Implants Become the Preferred Choice for Tooth Replacement? There is a wide range of reasons why an ever-growing number of people are choosing dental implants to replace their lost teeth. Therefore, dentists who specialize in these denture alternatives will be busier than any time in recent memory. Dental implants are the best decision according to numerous experts. Likewise, they are well-reviewed by most dental patients who have had implant surgery. The fast rise of implant surgery as an alternative to removable partial bridges is because dental implants are so similar to real teeth. There is no worry of slippage because the lab-created tooth is embedded into the jawbone. An empty tooth socket quite often results in the loss of bone matter in the jaw. Jawbone deterioration not only causes pain but can age a person’s appearance. Dental implants promote density of the jawbone, which is another well-liked benefit. Teeth implants have gone mainstream in the market today since they are the most permanent way to replace missing teeth. There is less chance of damage to the prosthetic tooth or teeth since they are not removed on a regular basis, as with dentures and bridges. Dental implant patients enjoy brushing their teeth as they always have, without taking unusual steps each day. Revolutionary new advanced-grade zirconia implants, development of robotically-directed dental implant procedures, and 3D printing are a few examples of trending advancements. 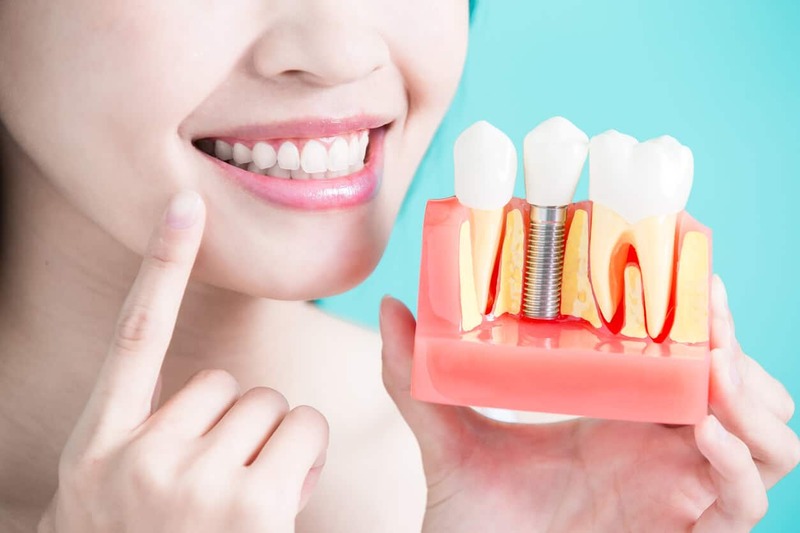 The development of high-tech ceramic dental implants by the company Z-SYSTEMS is a breakthrough that has improved the tooth restoration process. Ceramic implants made from advanced-grade zirconia have a natural look while having the highest success rate in the dental industry. The porous nature of the material allows for the natural bone and soft tissue to adhere well to the surface of the implant. Advanced-grade zirconia has a lower plaque-adhesion rate than titanium, which is a standard component of other teeth implants. This low level of plaque buildup means a fewer number of cases of inflammation and infection of the gums and oral tissues after surgery. Reports have shown that patients who have gotten these advanced-grade zirconia ceramic dental implants are satisfied with the results. In fact, Z-SYSTEMS implants are very durable and resist aging. The implant’s survival rate is about 98%. Fortunately, the drawbacks are few. Robotic dental implantation surgeries will before long be the standard practice for implant surgery. Yomi is one such robotically-assisted dental implantation innovation. A Miami-based company, Neocis, created Yomi to design an embedding strategy using a patient’s CT scan results. Yomi directs the drill and helps dental surgeons with the perfect placement of the teeth implants. This precise technology finds the exact location, depth, and orientation for an ideal fit. A robot recently performed dental implant surgery in China with complete success. The robot securely implanted two artificial teeth in a female patient without complications. Another advanced development in tooth replacement will be the use of 3D printing in creating tooth implants. 3D printed hyperelastic bone is an exciting new method to assist in bone grafting for patients that need dental implants. This material is a blend of polymers and bioactive substances. It shows better flexibility than most commonly used grafting materials. It’s also very porous. Thus, it promotes the quick growth of blood vessels into the surgical site. These printed bone grafts are low in cost and simple to create with the use of today’s 3D printers. Want to learn more about the latest advances in dentistry and what options are best for you? Contact the dental professionals at McCauley Dental. With over 30 years of experience and performing over 8,000 dental implants, Dr. Mark C. McCauley, DMD can help restore your healthy, beautiful smile. Call (561) 562-4060 today for a free exam.